The painting portion of the competition will begin 8:00 AM on Saturday, March 31st and will conclude at 12:00 PM Friday, April 6th. Painters can submit up to 3 pieces painted en plein air within Dunn County. There will be a reception and awards ceremony held at The Raw Deal 603 Broadway St S, Menomonie, WI starting at 6:00 PM Friday, April 6th. 35% of all sales will be donated to Arbor Place, Inc. Entry fee is $30 and free for students. Make check or money order payable to Arbor Place Inc.
We reserve the right to reject any art that does not meet our expectations or conform to the norms of the community. Art not adhering to our rules and restrictions will not be considered for admission. 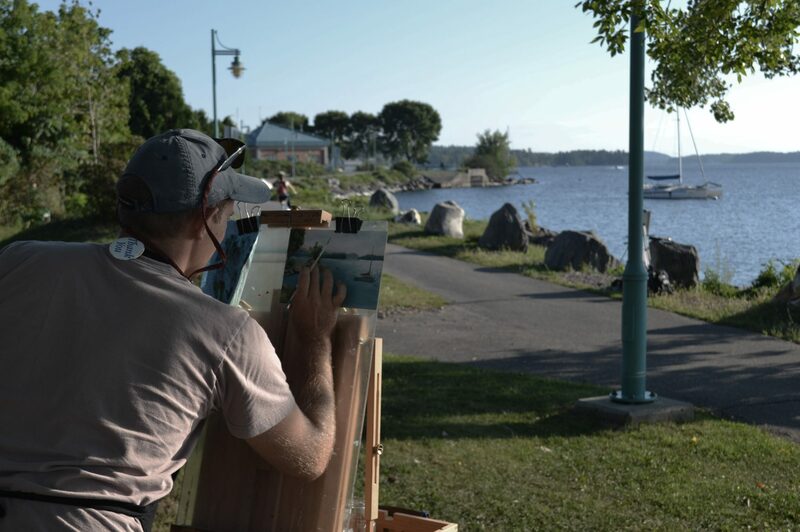 Paintings are to be executed “en plein air,” meaning outdoors, from direct observation of the subject matter. Working from photographs is not allowed. Ninety percent of a painting must be completed on-site, allowing for minor adjustments to be made in the studio. Artwork may be done in any painting medium including acrylic, gouache, ink, pastel, watercolor, oils, mixed media, etc. If you aren’t sure, just ask. Artwork must not exceed 320 square inches or exceed 24 inches on any side. Typical sizes that fit this limit include 16”x20” and 12”x24”. This is to ensure sufficient space for everyone’s work in the gallery. Subject matter may include anything within the boundaries of Dunn County. The competition/painting portion of the event will take place from Saturday, March 31st through Friday, April 6th. Stamping: Prior to painting, artists must bring their blank canvas/board/paper to The Raw Deal 603 Broadway St S, Menomonie, WI to get them stamped. This may be done every morning of the competition from 8:00 AM-10:00 AM. Only paintings with this stamp will be accepted. Artist may have several blank surfaces stamped and may return to get more stamped any day of the competition between 8:00 AM and 10:00 AM. Art Drop Off: Completed works may be turned in at The Raw Deal on Friday, April 6th from 8:00 AM until 12:00 PM. If you need to make other arrangements, please contact Marc. Framing: All work should be wired in the back and ready to hang. Saw tooth hangers are not allowed. Artwork must be either framed or gallery wrapped. Frame profiles must not exceed 3 in. in width. There will be a 35% commission on all sales, with proceeds going to Arbor Place, Inc.
Artists will have the option to donate a higher percentage to Arbor Place if they would like. These pieces will be marked to let buyers know of the artists’ donation. A reception and awards ceremony will be held at The Raw Deal Friday, April 6th starting at 6:00 PM and ending at 9:00. If you have any questions, please contact Marc Anderson at Marcandersonillustration@gmail.com or by phone at (920)765-1332.